Cleveland-Cliffs (NYSE: CLF), one of the leading iron ore miners in the US, saw its stock price decrease by more than 15% in the last one month. However, what is startling is the fact that CLF had no unfavorable news during this period. The stock fell prey to disappointing economic data from China and decreasing demand from the country’s steel companies. The volatility in the market during the last one week increased due to major investment banks like UBS lowering their forecast on iron ore prices for 2019 and downgrading Rio Tinto (NYSE: RIO). Though Cleveland-Cliffs has no exposure to the Chinese market, the stock seems to have taken a beating due to the overall iron ore market sentiment. CLF improved its profitability in 2018 and we have a positive outlook for the company for the near future. The iron ore market has recently faced bifurcation, in the form of high grade and lower grade categories, following a change in environmental policies in China. Being a high-grade iron ore miner, CLF is set to benefit from the existing high market premium for its products, and as Vale (a close competitor in the high-grade ore category) has cut its production and is still recovering from the recent dam disaster. We believe that this stock dip may have left the stock undervalued looking out over the next two years. We have summarized our key expectations about CLF’s price realization, revenue, profitability, and stock price movement in our interactive dashboard – How undervalued is CLF’s stock currently? In addition, here is more Materials data. In view of rising pollution and international pressure, China altered its environmental policy in 2018 when it announced that it will curtail the import of low-grade iron ore (with Fe content of less than 62%). Since then the prices of high-grade ores have seen a sharp increase over lower-grade ore. 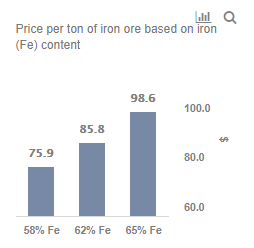 Historically iron ore would be priced on a Dry Metric Ton Unit basis, such that if a ton of 62% Fe would sell around $62, then a ton of 65% Fe would trade around $65, with a premium of $3. However, in October 2018, when 62% Fe ore was trading at $70 per ton, the price of ore with 65% Fe was as high as $92, which marked a premium of approximately $22 per ton. This was a result of higher demand for high-grade ores in China. After the dam disaster at its Corrego do Feijao mine in Brumadinho in January 2019, Vale – the world’s largest iron ore miner – has announced a shutdown of approximately 40 million tons of iron ore production, of which a large part is expected to be high-grade pellets. In anticipation of lower supply due to this event, the premium for high grade ores has increased further in the last one month. Currently, ores with 62% Fe content are trading at about $85.77 while the ones with 65% Fe content are priced at $98.60 per ton. We believe that as Vale is still recovering from the effects of the accident and with iron ore premium rising, this is the best opportunity for CLF to increase its market share in the US. Though Rio Tinto performed well in 2018, the rising premium is expected to benefit CLF the most. This is mainly because of the ore grades that these two miners sell. RIO primarily sells Direct Shipping Ore that ranges from 60%-62% of Fe content from its Western Australian Pilbara mines and other mines where the Fe content ranges from 56%-62%, with only one exception of Iron Ore Company of Canada which has a 65% grade. On the other hand, CLF sells only high-quality iron ore pellets with Fe content of 60% to 65%. As CLF’s entire revenue is concentrated in the US following the closure of its loss-making APAC operations, it is much better positioned compared to Rio Tinto and ArcelorMittal, which are exposed to volatile emerging markets like China and mine a large portion of lower-grade ores. After a sharp rise in margins in 2018, we expect CLF’s net income margin growth to be modest over the next two years, primarily benefiting from lower interest expense and cost savings from the closure of APAC operations, coupled with higher margin per ton due to rising premium. Additionally, CLF plans to increase the productive capacity of the Toledo HBI (hot-briquetted iron) plant from 1.6 million tons to 1.9 million tons, which is an indication of good demand for the product and a catalyst for future growth and value creation. We have a price estimate of $13 for CLF’s share price, which is higher than its current market price. In the current situation, we expect the price to rise to $14 in 2020 if CLF is able to take advantage of rising iron ore prices and fill the gap created by Vale. Though RIO’s share price has seen an upswing recently, the upside potential is limited with the recent downgrade and lower price realization with demand slowing down in China. Based on a current market price of $55, the stock could offer return/CAGR of about 13% in 2019 followed by 7% in 2020. However, entering into CLF’s stock at this stage (share price of $10 per share on March 13, 2019) could offer investors a potential return/CAGR of a whopping 30% in 2019 and 17% in 2020. Thus, we believe that the recent drop in CLF’s share price without any change in the company’s fundamentals, may offer opportunity.